The local Tasmanian driver would go on to win the next three rounds of the year, but his total lack of points from the series opener cost him the season’s title. But in 2019 there were no such issues for the star Targa driver on the first day of the new season. 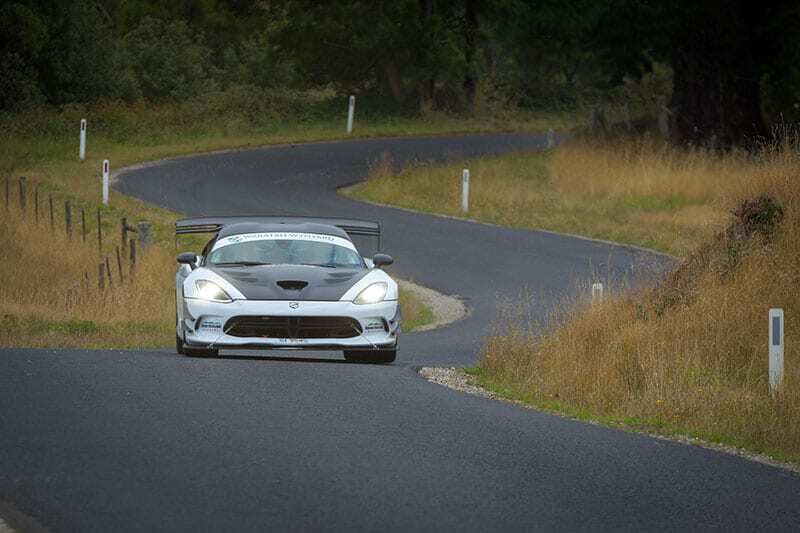 White and his co-driver, uncle John White, dominated the day’s proceedings, finishing the six stages and 83 competitive kilometres 60 seconds clear of fellow Dodge Viper team, John Ireland and Janet Binns. The battle for the final place on podium was an intriguing tussle between reigning Australian Targa champion Paul Stokell in his Lotus Exige and the Porsche of Michael Pritchard, with just two seconds separating the pair. White also leads GT2 while Jesse Medwin and Zak Brakey, in a 2011 Subaru WRX STI Spec C, lead GT4. The Devonport-based White was delighted to be back on roads that he knows so well. “We’ve had a very good run today,” White said. “The weather has been kind and we loved going through Oldina and Hellyer Gorge South in dry conditions. “The gorge was completely dry, which is rare, apart from a couple of small damp patches. Leading Early Modern is Jon Mitchell and Anthony Carr in their 2006 Subaru S204. Veteran Tony Quinn was a threat early for class honours, but crashed out on the final stage of day. In the classic handicap competition, Peter Gluskie and Samantha Winter, driving a 1985 BMW, have a handy 21 second buffer over Nik Prieston and Dylan Braithwaite, in a 1975 Fiat Abarth Rallye. In Shannons Classic GT. Mick Downey and Jarrod Van Den Akker had a clean run in their 1979 Holden Commodore VB. Mitchell Ringuet and Darryl Ringuet, 2017 Lotus Exige Sport 350 had a good day to lead the GT Sports Trophy, while the veteran pairing of Jack Waldron and Vin Gregory lead the Thoroughbred Trophy in their 1981 Mitsubishi Stigma. In the TSD Trophy competition, Peter Taylor and Tristan Taylor in a 2013 Lotus Elise S are showing how it’s done.